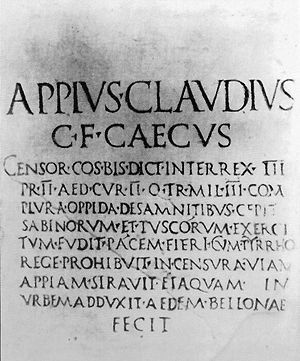 Transcription of an ancient Roman inscription in Roman square capitals. [註 1] The words are separated by engraved dots, a common but by no means universal practice, and some of the long vowels (e.g. in TVSCÓRVM) are marked by apices. Alkire, Ti; Rosen, Carol. Romance Languages: A Historical Introduction. Cambridge University Press. 2010. ISBN 978-0521889155. Allen, William Sidney. Vox Latina—a Guide to the Pronunciation of Classical Latin 2nd. Cambridge University Press. 1978 . ISBN 0-521-37936-9. Allen, William Sidney. Vox Graeca: The Pronunciation of Classical Greek. Cambridge University Press. 1987. ISBN 978-0521335553. Allen, Joseph A.; Greenough, James B. Mahoney, Anne, 编. New Latin Grammar for Schools and Colleges. Newburyport, Massachusetts: R. Pullins Company. 2001 . ISBN 1-58510-042-0. Brittain, Frederick. Latin in Church. The History of its Pronunciation 2nd. Mowbray. 1955. Clackson, James; Horrocks, Geoffrey. The Blackwell History of the Latin Language. Oxford, UK: Blackwell Publishing. 2007. ISBN 978-1-4051-6209-8. Clackson, James. Latin. (编) Roger D. Woodward. The Ancient Languages of Europe. Cambridge University Press. 2008. ISBN 978-0-521-68495-8. Gilbert, Allan H. Mock Accents in Renaissance and Modern Latin. Publications of the Modern Language Association of America. June 1939, 54 (2): 608–610. doi:10.2307/458579. Hayes, Bruce. Metrical stress theory: principles and case studies. University of Chicago. 1995. ISBN 9780226321042. Levy, Harry L. A Latin Reader for Colleges. University of Chicago Pressref=harv. 1989. Lloyd, Paul M. From Latin to Spanish. Diane Publishing. 1987. ISBN 978-0-87169-173-6. Neidermann, Max. Précis de phonétique historique du latin 2. Paris. 1945 . McCullagh, Matthew. The Sounds of Latin: Phonology. (编) James Clackson. A Companion to the Latin Language. Blackwell Publishing. 2011. ISBN 978-1405186056. Pope Pius X. Tra le Sollecitudini. Rome, Italy: Adoremus. November 22, 1903 [15 June 2013]. Pope, M. K. From Latin to Modern French with especial consideration of Anglo-Norman revised. Manchester: Manchester University Press. 1952 . Sihler, Andrew L. New Comparative Grammar of Greek and Latin. Oxford: Oxford University Press. 1995. ISBN 0-19-508345-8. Smith, Jane Stuart. Phonetics and Philology: Sound Change in Italic. Oxford University Press. 2004. ISBN 0-19-925773-6. Sturtevant, Edgar Howard. The pronunciation of Greek and Latin. Chicago: University of Chicago Press. 1920. Ward, Ralf L. Evidence For The Pronunciation Of Latin. The Classical World. June 1962, 55 (9): 273–275. JSTOR 4344896. doi:10.2307/4344896. Wingo, E. Otha. Latin Punctuation in the Classical Age. De Gruyter Mouton. 1972. ISBN 978-9027923233. Ecclesiastical Latin. Catholic Encyclopedia. 1910. Lord, Frances Ellen. The Roman Pronunciation of Latin: Why we use it and how to use it. Gutenberg Project. 2007 .